Here is the basic model of rhythm and swing factor, applicable to bluegrass banjo, jazz, blues, Buck Owens music, etc. The relative bits get varied, and the underlying shuffle beat/ train rhythm is similar. a = swing factor. This was called offset in the first edition of Gestalt Banjo Vol 1. For bluegrass music, 1 (flat timing) < a < 1.33 (tied triplets). 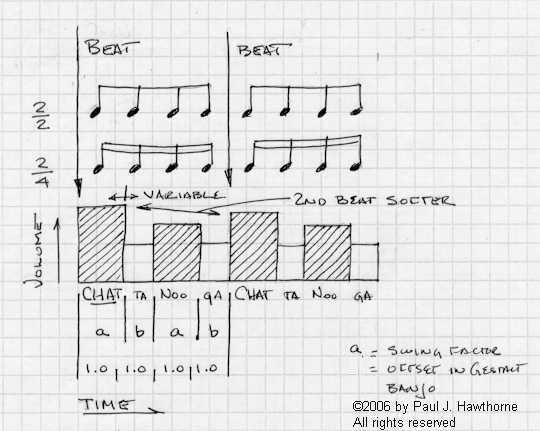 The basic rhythm cue is CHAT ta Noo ga. I got this from Chattanooga Choo Choo, made famous by Glenn Miller in the 40's. Bluegrass swing IS similar to big band swing, it was what was popular and on the radio during the formative years of the style, and influenced men like Reno, Scruggs and Monroe. They did not exist in a vacuum. Bluegrass pushes the beat harder, and is more percussive. The model above fits both. 98%+ of all tab is timed wrong. This is a trap. The error is kept alive by lemming-like habit and/or the writers not understanding what they are doing. Revealing this is not unlike the fable of the Emperor's New Clothes. A few authors get it right. The Scruggs books (both editions) and Bill Knopf's material like his original Doug Dillard book are 2 examples. As near as I can figure out, there are 2 main catalysts and one minor catalyst to creating the 4/4 error, and the time frame is about 1974 and subsequent. 1.) The way the tab is written in Pete Wernick's classic Bluegrass Banjo book. I believe Hank Sapoznik is the guy who hand wrote the tab. It is in eighths, and has no time signature. Because it has no signature and is in eighths, those with contact with other music pounce on this and say "Aha.....4/4....this is in the formal music books, or I learned this is music class". Why the tab is in eighths I don't know. Maybe Pete Wernick can relate on how that happened. I can make guesses, and it is not germane to do so. I would rather would learn from the source. 2.) Banjo Newsletter. No time signatures, eighth notes. A huge archive of quality tabs, timed wrong. 3.) A minor catalyst is the unfortunate lack of stems and beams in the first edition of the Scruggs book. I know there was a fight just to get tab in it at all, and having timing info there would have been really good. As it was, it leaves the door open. Guys don't want to take the effort to grasp the concept of how our timing system works. The spoken line "4/4 time means 4 beats to the measure and the quarter note gets the beat" leads to instant spacing out. It is just words. To make everything work if it is timed 4/4, just be aware enough to mentally or physically write in 2/2 in place of 4/4 and play to the 2 beat model. Melody, possibly syncopated, is accented on top of this rhythm foundation. For different players, bands, tunes and phases of the moon, the swing factor and relative sizes of the volume including which beat is louder is variable. AND.... the amount of swing factor, pushing the beat, and difference in volume/ accent of the notes does not necessarily stay the same during the same tune, depending on whether the played is backing up an instrumental, vocal, or soloing. Sometimes the notes may be almost the same length, flat, going past like telephone poles, sometimes very swung. The real answer is in learning to hear the full tune internally so well that you can replicate it. The graphic above is a map that will help keep your left brain (rational mind) happy. There is no nice simple, always applicable answer as sought and hoped for. This is not on the page and never will be. It is learned by incessant listening and internalizing, getting past the boredom of the same old tune and into its essence and beauty, then supplying the missing essence from memory to fit the motif in your playing.